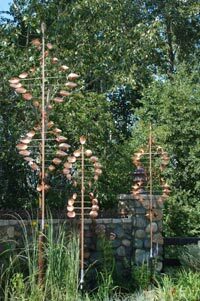 Spinning like DNA in even the slightest breeze, the Kinetic Copper Wind Art greets all customers as they arrive. It never fails that when Katrina goes away on a garden convention she comes back with more than tired feet. In 2009, the Perennial Plant Convention was in St Louis, Missouri. It was here that she first encountered Wind Art of this kind. “I need that” was the comment, and shortly after three pieces arrived in Black Diamond. Soon after it was installed many customers began to ask where they could get wind art. So the short answer is that now Vale’s Greenhouse sells wind art. The artist was so intrigued that he personally drove the art here all the way to Black Diamond for lunch (it did take 4 days of driving). We sell several different sizes that are similar to the ones that you can see spinning in the driveway as you enter Vale’s Greenhouse parking area. All the hardware is provided and all you need to do is choose the area, dig a hole, mix and pour a bag of ready mix cement. This process should just take a few hours. 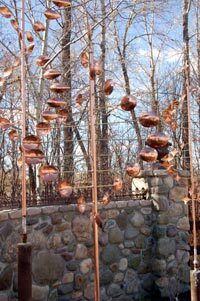 Once the cement is dry you can mount the copper pole and put on the spoons. “Modern art often leaves me feeling flat” says Katrina “but this, I just love this! If I need to have art explained to me then the artist missed the mark”. 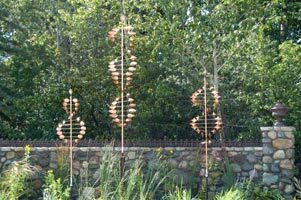 This needs no explanation as it spins silently and calmly, adding a whimsical feature to the garden that delights all that see it.